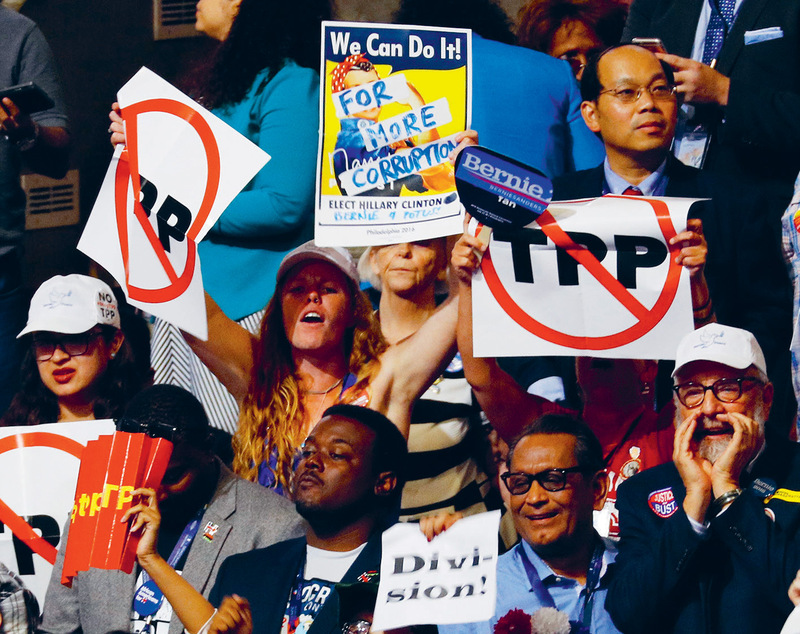 Trump and the Left may agree about TPP and NAFTA – but not for the same reason or with a shared vision for the future. What is an internationalist to make of Donald J Trump’s vow to blow up the North American Free Trade Agreement? As of late April, President Trump was preparing to issue an executive order commencing US withdrawal from NAFTA, which he has criticized as ‘one of the worst deals ever’ for American workers. Analysts interpreted the move as a hardline bargaining ploy, designed to force Mexico and Canada to renegotiate the agreement on terms more favourable to the White House. I hate to agree with Trump, but he’s right about NAFTA – and about the Trans-Pacific Partnership, which he scuttled after blasting the deal as ‘another disaster done and pushed by special interests’. The problem is, the president’s vision for the global economy is hardly one based on universal rights and cross-border solidarity. On the contrary, his faux-populist track record suggests that anything Trump does to renegotiate NAFTA will be geared toward providing handouts to his billionaire buddies. Back in the late 1990s and early 2000s, at the height of demonstrations against the World Trade Organization and International Monetary Fund, many protesters rejected being labelled an ‘anti-globalization movement’ by the media. More accurate, they argued, would be to understand their mobilizations as part of a ‘global justice movement’ with deep international ties. Anti-corporate critics contended that the question was not whether we would have some form of globalization, but whether this order would be based on neoliberal economic mandates or on genuinely democratic principles. Feeling pressure from the grassroots, more than 90 per cent of Democrats in the House of Representatives voted against the Central American Free Trade Agreement in 2005. And yet, the neoliberal wing of the party still holds considerable sway. Bill Clinton, who fashioned himself a business-friendly ‘New Democrat’ in the 1990s, was the leader who pushed through NAFTA in the first place. Barack Obama, who spoke out against pro-corporate trade deals as a candidate, reversed himself once in the White House and began championing the Trans-Pacific Partnership. Hillary Clinton came out against the TPP on the campaign trail. But since she had previously supported it as Secretary of State, she was simply not a credible messenger. All this created a window for Trump to capitalize on legitimate public anger about so-called ‘free trade’ deals. What would a fairly renegotiated NAFTA actually look like? In mid-January, trade unionists, family farmers and environmentalists from Canada, the US and Mexico came together to articulate a vision for NAFTA replacement ‘based on social justice, sovereignty, and sustainable development’. These advocates have called for adding strong and enforceable labour standards to the agreement’s core text; ending NAFTA rules that increase the cost of medicines; and eliminating the ability of corporations to use secretive trade tribunals to attack environmental and public interest policies. We can be certain that Trump will pursue none of these changes. Using the rhetoric of rightwing nationalism, Trump has stolen the issue of trade, even while continuing to serve the interests of the wealthy. It’s up to us to present an alternative vision, just and internationalist, and to steal it back.